Shopping on 5th avenue is not the only thing I love about New York City, but also muffins, scones and cakes. Since it’s a food blog, I will have to skip the shopping tips and trends of the week news and put you on the fast track to sweet tooth news flash. To all the cakes lovers out there, NYC is your haven! Breakfast is my favorite meal of the day and I find a pleasure in the morning instead of having it at the hotel, to go out, walk Manhattan streets and stop by one of my preferred cafes to have my granola berries breakfast with a cinn raisin bagel (shortening of cinnamon-raisin bagel) and a cupcake or a slice of cake take away. 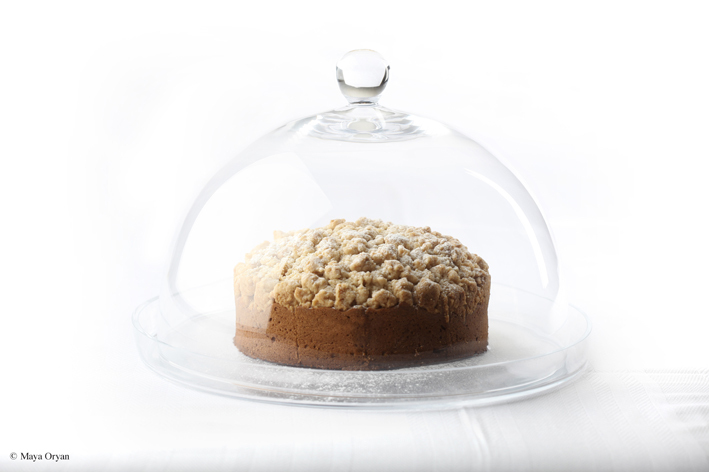 Nothing tastes as delicious as homemade New York-style crumb cake fresh from the oven, especially if prepared the old-fashioned way. Paired with home made berries jam and sprinkled with fine crumbles and icing sugar. Mmmmm, luscious! Get ready to be transported to a fluffy bliss with this stylish cake recipe. 2. Grease a baking pan. 3. Make the crumb topping: In a bowl, combine together flour, cinnamon, sugar and salt. Pour warm melted butter over mixture and rub with your fingers to make medium and large clumps. 4. Whisk together flour, baking soda and salt. 5. In a separate bowl, beat sugar and butter until fluffy. Add eggs one at a time, then vanilla. Beat in flour mixture alternating with sour cream until well combined. 6. Pour batter in the baking pan and sprinkle the crumbles evenly. 7. Bake in the oven for 40-45 minutes until the crumble is browned and the skewer inserted into the centre of the cup cake comes out clean. 8. Transfer to a wire rack and wait until cool. 9. Dust with icing sugar. Serve. Try it with a touch of jelly. Once you pour the batter in the baking tray, spoon the jam over it and finish with sprinkling the crumbs. 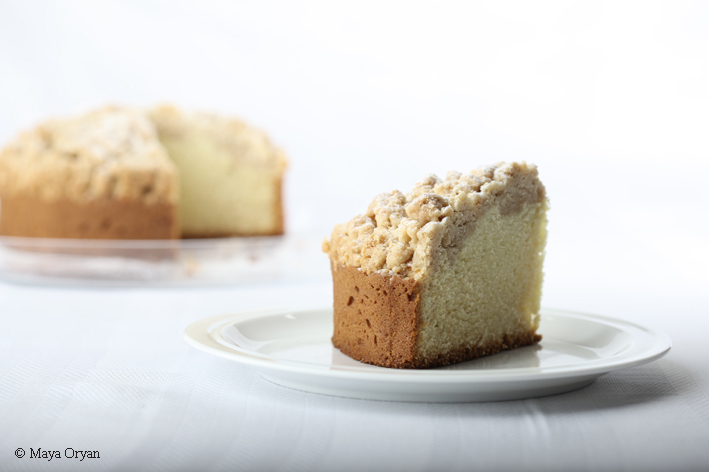 This entry was posted in Desserts, Recipes and tagged Cake, crumb cake, food photography, Food Stylist, lebanese food blogger, Maya Oryan, New York Style crumb cake by Maya Oryan. Bookmark the permalink.